The following girls are TOVERO. 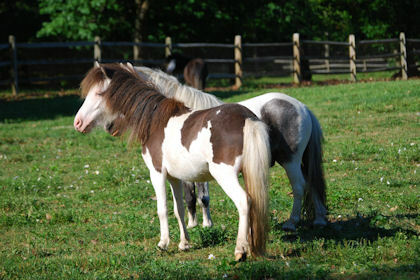 This term refers to horses that carry both the tobiano gene as well as an overo gene. Hidden Timbers Streak of Glitter is registered with the AMHA/AMHR/PtHA. She is out of our homozygous mare Annie (above) and sired by Streaker. She is as sweet as she is pretty. LWO positive, with one pretty blue eye. 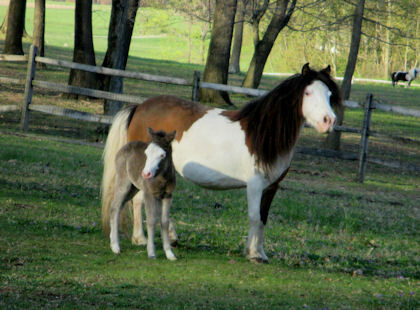 Like most of Streakers foals she has his short little head, long neck and super correct legs. 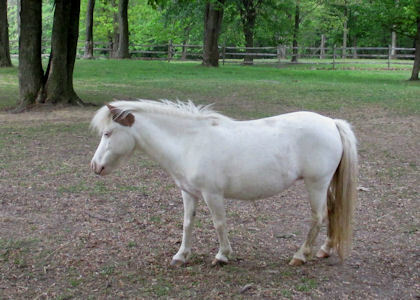 Glitter has an unbelievable disposition, she is the "baby" of the farm. She stands appr. 32" tall. 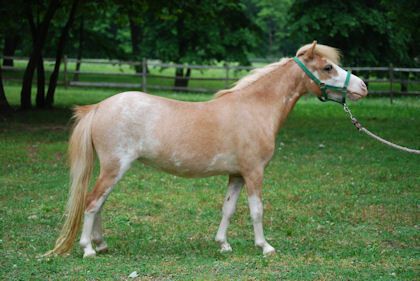 Glitter was bred to Peppy for 2014 and produced a gorgeous buckskin tovero filly with blue eyes. She is taking this year off. 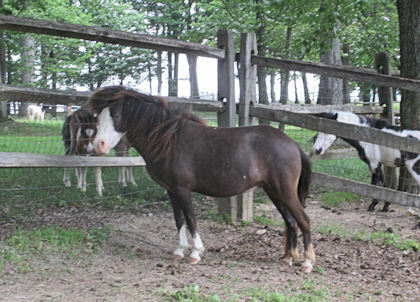 Hidden Timbers Sparkling Doll entered the world on May 4, 2011 she is a jet black and white tovero filly with two blue eyes, correct conformation and a gentle disposition. 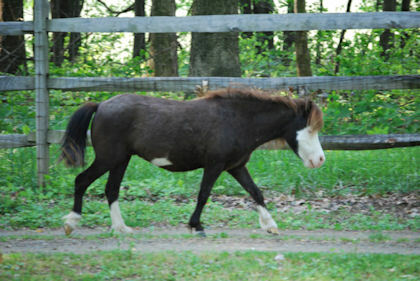 Sired by War Chief and out of our homozgyous black and white mare, Patches (MD Little Doll). 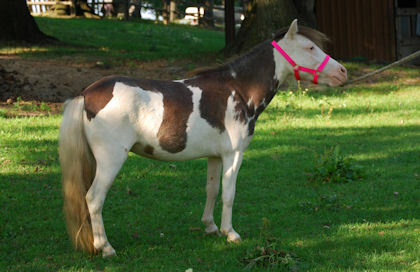 Sparkle has tested homozygous tobiano and homozygous black. 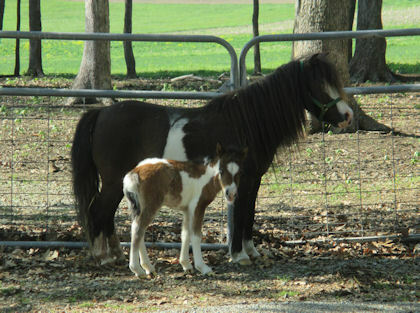 Sparkle has been bred to Gander Hill Peppys Tattoo for a guaranteed homozygous tobiano foal! Hidden Timbers Streak of Pebbles is sired by Streaker and out of our old foundation mare, Trey Acres Lu Molly. We were lucky enough to have the opportunity to purchase Pebbles back in 2014 and look forward to seeing what she will produce for us. Pebbles is a sorrel tovero, lwo+. 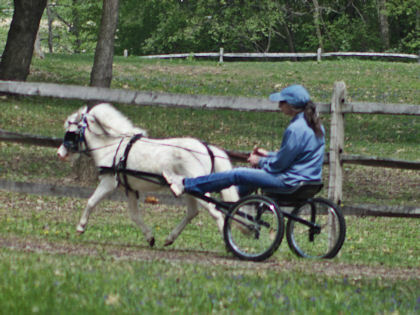 She is the ultimate in gentleness, truly one of those "in your pocket" type horses. We are so pleased to have her back with us! The rest of our mares are LWO negative OVERO, either splash white or sabino, we'll start with the SPLASH WHITE OVERO girls. Their white is not broken and it comes up from underneath, usually right up the legs and into the body. Splash white horses usually have complete apron faces with blue eyes and only seem to occasionally have eyeliner. Hidden Timbers Streak of Miracles was born on May 11, 2011 out of Lilliput Acres Miraculous Alex (chocolate sabino) and sired by Streaker. 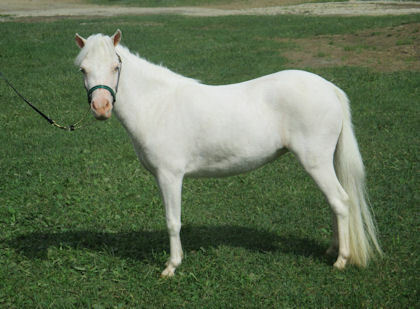 "Mira" is a stunning mare that has tested positive for sabino1, negative for LWO and homozygous for splash white. Very correct pretty girl with blue eyes and a ton of personality. Mira is full sister to Spring. 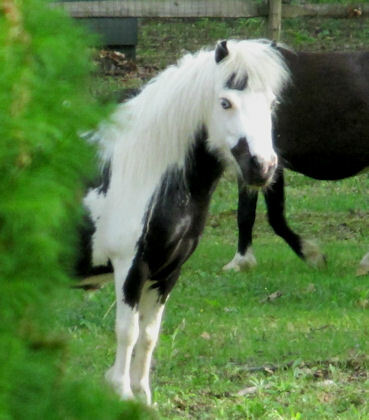 Hidden Timbers Splash of Ebony is a 2005 AMHA/AMHR black splash white overo mare with gorgeous blue eyes set in a spectacularly beautiful face. She stands 33" tall and is sweet and docile. We have hardshipped Ebby into the AMHA. She is that nice! 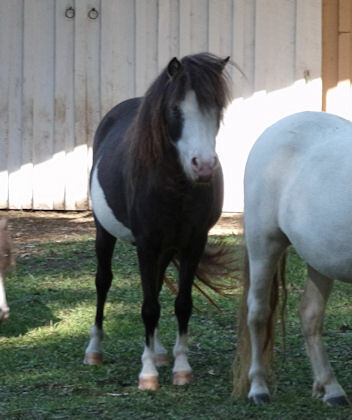 Ebby has given us three perfect, little fillies and has taken a couple of years off. Ebby is bred to Streaker for 2015. Hidden Timbers Charming Streak is truly a dream come true. 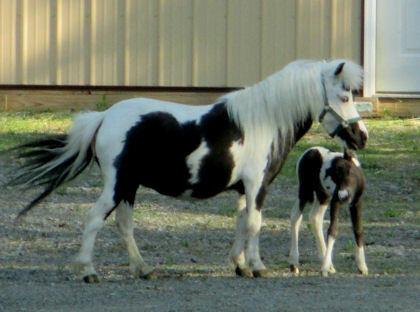 A black splash white overo sired by our Streaker and out of Cherry, this gorgeous filly has matured close to 34". 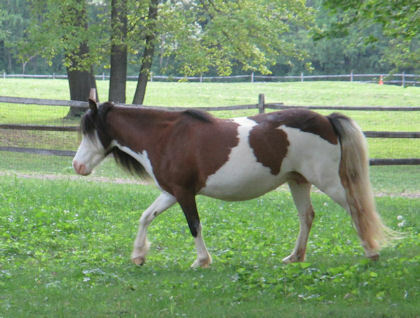 She has been tested and found to be homozygous for the splash white overo gene. She has the straightest legs, prettiest head, longest neck, bluest eyes and undoubtedly the sweetest personality. Her jet black color and lwo negative test results make her the perfect choice for us to keep for our future. Charm was retained to breed to T-Bone and this year we are doing just that. Can't wait to see the results. 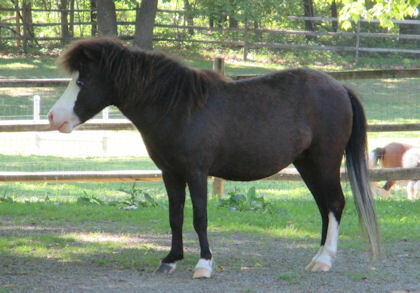 Charm had a handsome chestnut colt with a big blaze. She has been bred back to T-Bone for 2015. Hidden Timbers Precious Streak is home to stay! A black splash white overo sired by Cozy Corners Streak of Magic and out of Hidden Timbers Splash of Ebony, Precious stands almost 33". She has been tested and found to be homozygous for the splash white overo gene. Such a dear, sweet girl!! Super friendly and gentle, looks soo much like her mom. A beautiful mare we are pleased to have been able to get back. 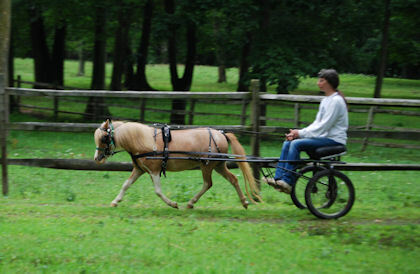 Precious has been bred to Wiley for a 2016 foal. Rauchs Rowdy Splash is a 2004 AMHA registered, 33" bay splash. I just can't say enough about this beautiful girl. She has outstanding conformation, an amazing neck and is gorgeous from any angle. "Alibi" has come to us in the spring of 2011. 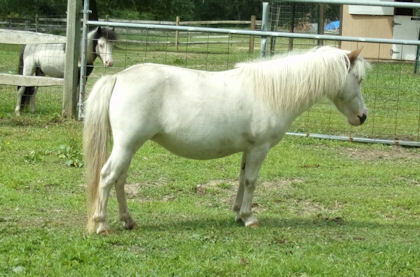 She and Streaker have given us two beautiful homozygous splash white fillies in a row. I am keeping her 2014 filly for our breeding program. Alibi is taking this year off, she deserves it! Hidden Timbers Streak of Spring, when Spring was born I just could not believe my eyes, she is a perfect replica of her mother, unquestionably one of the best broodmares we ever owned, Lilliput Acres Miraculous Alex. Spring was born in 2010 and is sired by Streaker. With her eye catching sabino markings, her beautiful blue eyes and her gentle disposition she is just what I like. 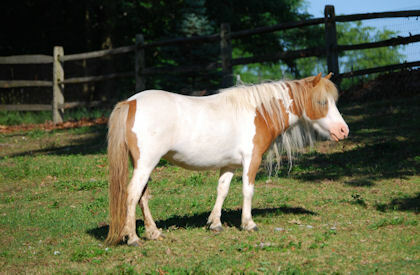 Spring carries both sabino and splash white overo genes. Look at that stride!!! This is what we are breeding for! 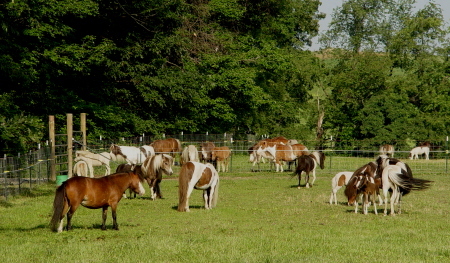 Spring is bred to T-Bone for a spring 2016 foal. Hidden Timbers Streak of Pearls was born in 2012. Snow white with bright blue eyes this little girl is very special. 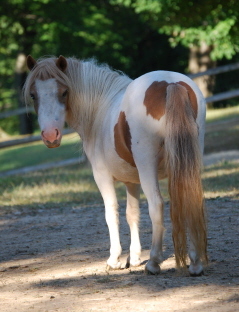 She is sired by Cozy Corners Streak of Magic and out of Jewel and like all of Jewels foals she is sweet and gentle and friendly. For those of you unfamiliar with the white overos, Pearl is deaf. Pearl has tested positive for LWO and homozgyous for the splash white overo gene. Pearl has been bred to Canterburys Wildly Executed (Wiley) for 2016.